The death of a woman in a motorcycle accident in Thailand has sparked huge interest on the internet after a video of her ‘soul’ leaving her body quickly went viral. The deceased goes by the Manee and her male companion Banjongrat was severely injured, reports the Mirror. The CCTV footage reveals how she was fatally knocked off the motorbike by a car, crashed into a power-pole and thrown to the ground. Suddenly what looks like a black orb emerges from the body. 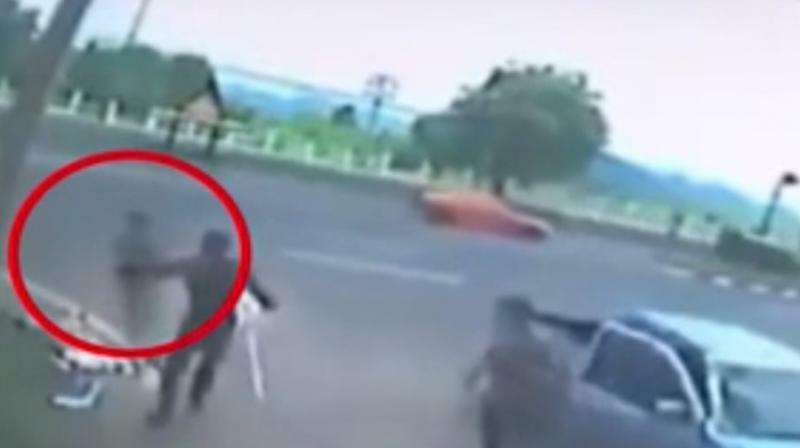 The driver of the car rushes out of the vehicle over to the two bodies on the ground before the dark shadow vanished. The footage was captured outside the Phibun Songkram Camp in Lopburi, Thailand.